Nazareth Magarian: Good morning. Perhaps you know, but I’d like to tell you again that Eric’s favorite flowers are white hyacinths, so we have some ... Hyacinth are out of season, but lovely splendor of them here. And the song that Paul just played, and Georgia sang, was written by Eric. It’s white hyacinth. I’m Nazareth Magarian one of the board of directors of Unity here in New York, and it’s a joyful time today. I extend to you a joyful welcome, joyful because we’re celebrating 30 years of Eric’s ministry here at Unity in New York. It’s a remarkable accomplishment. We honor Eric with a keen sense of gratitude and love for his continued imparting of his knowledge and wisdom to so many through our Sunday worthship services. Through our retreats, our spiritual growth workshops. The center workshops, the discovery class downstairs. Eric’s radio talks, the books, articles, tapes that flow not only to us here, but throughout the country, and in many parts of the world. So appropriately, we give thanks at this celebration and our Thanksgiving Week. 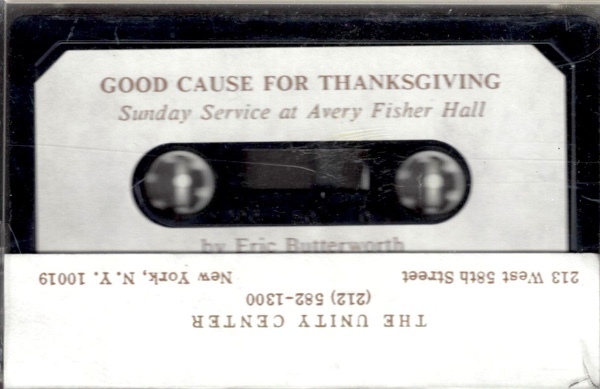 And Eric’s talk today is entitled “Good Cause for Thanksgiving.” Olga will provide us with a beautiful guided meditation for the occasion, and Paul Trueblood and Joy will be back to sing again. And Michael Heath will be joining them for the harmony of beautiful music. So, we are in a celebrity attitude and mood, and it’s your loving and supporting energy that makes it a very joyful occasion. Just a word of note as to the other flowers displayed here, it’s again attribute to Eric that outside of our Unity world there was great respect. The staff of Avery Fisher Hall sends congratulations on your 30th year and surviving 30 years in New York. And furthermore, helping us to survive. It just continues. Lots of love to you and Olga, bless you for blessing our house. Lots of love staff for the Avery Fisher Hall, and their presentation of flowers. So enjoy the service that’s we’ll share together for the next hour. You know the love and the affection and the respect with which we all hold Eric is often very difficult to express. In fact, his presence, his peace and serenity speaks for itself, and it’s on occasions like this where we can let him sit back a little bit and permit us to express that love. I’m pleased to be part of that, and I speak for our board of directors, our staff, and I’m sure for all of you. On the back of your program is a statement of the board’s and staff’s appreciation of all of what Eric Represents. But you know we also get letters from all over. I’d like to share with you a few thoughts that have come from those who have worked closely with Eric over the years in the Unity movement. For example, from Bill Fisher, who is director of retreats at the Unity Village out at Unity Village in Missouri. And he’s addressing this to us. And it’s not only his contemporaries that express these things, but of course all of us who have been touched by his ministry. And these comments of ... Things you won’t hear from Eric himself, we get this sometimes because, Olga of course, and Betty and others in the center receive phone calls that come into the office. A few months ago we received the call from London, and the person identified himself as a researcher for the Prince of Wales. He is conducting some special research for Prince Charles and asked for an appointment to see what Eric could share with him. And within two weeks he met with Eric at the center. So, it’s this kind of genuine spiritual networking that takes place. There’s a general theme, a general note in all of the comments and letters we receive, implying that a spiritual hunger is being fed, nourished through the lessons and examples set by Eric. The sense of discovery at finding Eric is a universal chorus. And we know, and it’s an established fact, that Eric is probably the most quoted and emulated teacher in the Unity movement. And those who have expressed themselves remind us of that from time to time. Be aware of the stillness that you come to so easily. And in this season of thanksgiving, would you take more time to be grateful? The human of us looks around at the outer and is grateful for people and experiences, for unfoldment, for understanding. That of us that is learning and growing can look back and as each one of us looks at our life up to this moment. People who’ve helped, people who been a spur, experiences that have been wonderful at the moment, even the experiences that may have been painful, we can look at it all and know it’s all been part of our growth. And through it we’ve come to where we are right now. But everyday is another day, another experience, another unfoldment, a deeper awareness, an Aha, and Oh yes. And we’re learning to be grateful from that inner awareness. Not just looking at the effects, appreciating them, putting them in their place, seeing them in the right perspective, but being grateful always from that that is unchanging. From the source, from that creative energy that is each one of us. That love that creates us in it’s own image, and creates us co-creators that we may let this creative flow or continue, and unfold, and manifests in our world. So, we would come to that place, that very special place where each one must go for themselves. That inner chamber, and very gently and quietly close the door on everything else for this is your time for you. And in this feeling of celebration, you be aware of the symbology that is within you. The spiritual feast. Behold, I prepare a table for you. Remember that in the 23rd Psalm, regardless of what is happening out there, within you there is this table laden with spiritual gifts. Gifts that only the infinite can give you. And as you come into this place, and go and touch the gifts, each one you touch suddenly becomes incorporated into you. The gift of peace, the gift of life, the vibration of love. The radiance of light, the clearness of understanding, the joy of oneness, it’s all there. And it isn’t just yours, it is you. And the more you give way to each gift, the more it unfolds and there is more and there is more. Inexhaustible and always radiating out, expanding. That energy within that says, “I am you. I am the kingdom and I have one intent, to be without limitation, without any holding back to express myself as you through you right now.” Can you believe that there is that of you that only knows itself? Its wholeness, what Jesus called the kingdom. What you might call the presence, or your higher power, or your divinity, or your Christ self, however you refer to it, but it’s you. It has never known a moment of sadness. It can only know itself and it’s you. Expand with that, even if you can’t completely understand it, and all of life is an expansion of understanding. Every day we understand a little more, a little more, a little more. But at least accept as much as you can right now. See that you and the gift or one and the same. Identify as that light. Identify as that love, and that peace. And expand with the awareness of abundance, all good, all good. Then hear for yourself that still small voice that is constantly saying, “You are my beloved,” be that love. Give way into all that is you. Be grateful, for every time you’re grateful you’re opening another door, not because you’ve done something wonderful because you’ve acknowledged yourself, and gratitude expands just like love. Now, from this place, we can look around us, grateful for each other, grateful for this beautiful symphony hall that becomes our cathedral every Sunday morning. We come here together, and we are blessed by the accumulation of love and appreciation that has been going on here from the very beginning of the building. Through all the concerts, through all the joyous times, and through all the Sundays we’ve shared together. Just think of that accumulation, that blesses us and that we continue to bless, constantly giving and receiving. Be grateful for everyone who has come, and who has in some way opened another door, or let go of a weight that did not belong to a spiritual being. And be grateful for the joy of participating in a universe that is always expressing itself as you. Just feel the light and love that you cannot contain within you, but radiates from you. Just be grateful for divine law, how beautifully it works, and let it flow through you right now. And without moving, you can think of whoever you will, you are going to encircle our whole world, in that moment you know oneness, and you’re giving way to wholeness, and be grateful. Then now come back again to that secret place. Very aware that the more you accept, the more give way to, the more there is. You can come to this place whenever you want, wherever you are in the second you’re there. And the table is always laden, and the love is always flowing, and the energy is always you. And we come to that place where words are so limiting, feeling is where it’s at, giving way, accepting and expanding. Every day, take time to be grateful from the center of your being, and let your gratitude radiate out to unfold in it’s perfect way. And we accept this for ourselves, for each other, and for everyone everywhere. One presence, one infinite mind, one creative energy that we call love, one magnificent light. Individualized as each person on this planet, and so it is. The word thank you is not enough. I’ll just try hard not to get emotional. Then again, maybe I should. I see a man hold things in, and I said, “Let them go,” so should I break down and cry here you’ll know why. Certainly this kind of tribute is, as we said in our title this morning, good cause for thanksgiving. This is a very special day for me. I hope it will be a special day for you. 30th anniversary is a matter of time, what is time? For one thing is, you look back 30 years as I see it at least, the 30 years has just sort of whizzed by. Look ahead 30 years, just having to think that the 30 years from today will be the year of 2021. And it sounds like way off in the Star Trek Age. And my generation, the [Buck 00:25:51] Rogers age, time does strange things to us. Time is basically an opportunity to achieve, to do something. Mine has been the opportunity to work with thousands of people, helping people to discover the power within them. To this end, and I think I have given, in New York at least, nearly 2000 Sunday meetings, 2000. You imagine when I started off many years ago like, thinking, hey, you got 2000 talks to give. This has been supplemented by thousands of lectures, workshops, seminars, retreats, more than 10,000 radio talks. The beautiful part of this all is that, early along in my life, I caught a secret. There’s an endless flow of creativity within you. Anytime you run dry, when you think you’re running dry, and you’re looking for excuses, if you doubled your effort and go back to work. During the years that I’ve been involved doing radio talks especially, one time I was ,again, doing radio talks, seven days a week here in New York City. And on [inaudible] nationwide, coast to coast broadcaster with CBS five days a week, entirely different talks. And you create all these every, every day, and with an addition wot Sundays, and Tuesday lectures and other things along the way. This has been a goal, almost a compulsion with me. Today, I celebrate the 30th anniversary in New York City. What are you celebrating? I love that part of Longfellow, the secret anniversaries of the heart. We all have anniversaries, if we take out and remember them. A commitment of some kind that you made some time in your life? You began to enter the relationship, you lost a career on a new venture? Or perhaps just a date last year when you begin to live the first day of the rest of your life? These anniversaries are very meaningful to us. As we look for reasons for Thanksgiving today we can look back and see these anniversaries, and be blessed by them. When you’re living in awareness of wholeness everyday is a time to celebrate the secret anniversaries of the heart. Here you came into truth, steps of growth along the way, overcomings that you’ve made, challenge yourself today, that a year from today will be an anniversary of some peak experience. It’s a good golden rule for any day. “I will so live this day, that a year from today I’ll be celebrating some peak experience.” So, no one has achieved anything without great support of countless people. There’s a long line of people that I’ve worked with, and who worked with me here in New York City. We don’t make much of our organization, we keep it all behind the scenes. We tried to keep it in personal. We don’t want to have institutionalism or bureaucracy sticking out all over. We’re concerned basically with the truth that we all work with, and grow in. But I could acknowledge now the many, many people who have served with me as trustees of the Unity Center here. Absolutely proud group of trustees, and I can name John Papas, Nazareth Magarian who you’ve heard today, Betty Golrad, Dr. Joseph Castalina, Lloyd Foster. I have to add because she’s a trustee also, my lovely wife, Olga, who has made all the difference in my life. And I could just acknowledge the principal assistant Justin Morley, staff worker, Christopher Webber, and the host of volunteer workers who are serving now and have served through the years. Some who you see here as ushers on Sunday, and then working at the book table, and at the center. Marvelous people. Certainly, it would be impossible to do the things that I’ve done without them. Many helping hands, I call them the hands of the universe reaching out in support. It’s a beautiful thing. Today we celebrate thanksgiving. Thanksgiving of course is next Thursday, but we celebrate on a Sunday to give us time to reflect upon that, and get our thoughts first sorted out. So, by Thursday we can have a real rollicking old fashion Thanksgiving. Before we enter the Thanksgiving day consciousness, I want to challenge ourselves with some important things. Why do we give thanks? Why do we give thanks? Does God demanded that we think Him? Will his feelings be hurt if we don’t thank Him? I say even though it’s shocking, that I’m ... many who know me by now, I’m used to shocking people. It makes no difference to God whether you give thanks to Him or not. It makes no difference to God whether you have Thanksgiving or not. It’s makes no difference to God whether you bow your head in prayer, involved in religious things or not. But it makes all the difference to you. Sadly, there are many people who think that we can enforce it. But thanksgiving means so much more than just giving thanks for things we have. It’s nice that we have them. So, really we could think of the things we have ask ourselves how sincerely and earnestly we’d be trying to get them if we didn’t have them. Think of all the things that you have that you take for granted. Just suppose, to be negative for a minute, that they were all swept away. What’s only left is just you and your friends. Your relationship to the universe. Would you feel empty? Just think about how earnestly you’d be thinking, “Oh, if I just had that job? If I just had my house? If I just had my family? If I just had, maybe to go through all the things that were routine, everyday things we take for granted?” It’d be high on our list of desires if we didn’t have them. This young man away from home, he could have felt sorry for himself, he could been indulged himself in some way, but he’s got a new meaning of Thanksgiving. The giving of thanks Thanksgiving. It’s a very important realization. Sometimes we’re so busy thinking in terms of what we’ve gotten, what we don’t have, and what we’d like to have to give thanks for, to overcome ... One of the greatest privileges we have, is the privilege of giving ourselves. I mean, think about Thanksgiving and we think about what we have to give thanks for. And there’s an old count your blessing blessed idea. You remember the song, count your many blessings. Count them over one by one? We’ve all been through that I’m sure. The idea is trying to practice. By all means go through the the splendid routine of giving, giving thanks to things, but it’s something more. When you count your blessings, to mention a realization that has come to me recently, count to one before you do anything else, count one, count the one universe, the wholeness, divine mind, God. The Divine Self, the creative flow. Count to one. We need to go no further than that. But the key to Thanksgiving is basically not giving thanks for something, we do that and sometimes we don’t think we have, but too to give thanks for. But it’s giving thanks from something. There’s a giving way of giving thanks from the center of your being, creative, love, intelligence, helpfulness, giving thanks from this. No matter how little do you have to give thanks for you always have reality to give thanks from. That’s right, I even suggest you place your center of your attention during this Thanksgiving this year. Decide that you’re going to turn your thoughts away from the routine of going through all the things of your life that you have, that you’re grateful for. It’s fine to do that, but don’t stop there. Take time in this Thanksgiving day to be still. Give thanks for the universe in which you live. The activity of God that has seen fit to create itself as you, sustain you, and to bless you, to always be with you as your support, your security, your love, your success potential, your health. Give thanks from this consciousness. George Bernard Shaw once said, “God has given us a world that nothing but our folly keeps it from being paradise.” Nothing but our folly keeps it from being a paradise. Today I heard somebody say, “It’s a terrible world.” I like to say, “What else is there? You got a better one?” You know, where to go and pick up another one someday? Face it, you’re in it. I won’t say you’re stuck with it, but you have the opportUnity to be a blessing in it, but it’s yours. It’s you. The person who counts to one in his quest for something to give thanks for, the person who will always believe and say, “It’s a wonderful world. It’s a wonderful world.” It’s a wonderful if I see the wonder, if I project the consciousness of giving. Become a part of the solution to the world’s problems, instead of being a part of the problem. So, I read the news of the day and analyze the things that are going on, instead of saying, “Oh, it’s terrible. It’s terrible what’s going on. You wouldn’t believe it.” Count to one. Get the sense of the divine flow within you. What they say about their world doesn’t matter, but what about your world? Your world is that which is around you. It’s your consciousness. It’s your family, your friends, your work, those parts of your nature that you’ve viewed yourself in those things. That’s the thing that is the wonderful world. It will always be wonderful world wherever you are if you give thanks to one. If again, you give thanks from the consciousness of God, from the divine flow within you, you’d always have enough. A person would to say, “I have a need for God’s help.” The person says, “I need guidance. If we have to just guide me now, or I could find the person to guide me.” It’s a great insight into the spirit of thanksgiving. Give thanks. Something I learned very early as a child, being taught by one of my greatest teachers, my mother, was a great truth student. She would always say, “The most important way to pray is to give thanks.” Because when you’re giving thanks for all things, as Paul says, giving thanks is an abundance in spirit. But giving thanks is a sense of projecting this consciousness prepares a projection. We thought of prayer as reaching out to somebody out there he was waiting for something to happen down here, but apparently the projection is a conscious within you. As Emerson says, “The contemplation of the facts of life from the highest point of view.” Give thanks. And give thanks as the projection of consciousness by which you pray for anything. You need guidance? I need to give thanks for guidance. I need a job, I give thanks for a job. You need a good love relationship, I give thanks for the right person in my life. I give thanks for health. Try this simple process is the way my mother lived. Just give thanks for things. And don’t get bogged down in say, “Well, how can I give thanks for health when I’m sick?” Giving thanks in a sense of projecting a consciousness of wholeness. There’s a reality in you which is always whole even though you may be experiencing illness. There’s a wellness within your illness. The reality of you that’s always in a creative flow, never runs out of ideas. Even though you may feel your have writer’s block, or you’re bogged down and feel yourself, put upon and overworked. There’s a reality of you that’s always in the flow, always your support. Give thanks for good. Thanks for harmony and order. Walk into your office or shop and you find a lot of discord, and a lot of in harmony, before you let yourself think as many of us do humanly, “This place is going to get on my nerves, what are we going to do? How can I get along in a place like this? These people are so negative.” Before you get into that consciousness, take time to count to one, and give for divine order here. You’ll be projecting that consciousness of order there, turning on the lights. Bring a new dimension into the place. You wont change everybody, you’re going to change the office at all, but you’ll change you. Can turn from becoming a gloom caster to a light bringer. I always love that character of Joe Btfisk, Al Caps’ creature of gloom. And rememmber Al Caps’ the creature with a black demeanor and black robe, the black cigar, and a black hat, and a black cloud over his head, spreading entropy wherever he goes. Hens can’t lay, cars don’t start, it always rains. Everything goes wrong when Joe Btfisk is there. He’s an enrepreneur of darkness, and he’s good at it. You probably know a few of these yourself. This is the opposite of that, is the character of light, the potential of light within you. And all of us have the potential to turn on the light. In a sense, you have a choice. It’s hard to be between. When you walk into a room, into a committee, or into a job, or into a home, either you’re going to be an instrument of light, you’re going to be a cloud of gloom, darkness. Choose you this day who you will serve, and that’s the scripture. What do you choose to be? If you count to one, give thanks for the creative flow within you. Let giving thanks be a watchword with you. I give thanks for good. I give thanks for harmony. I give thanks for peace. I give thanks for good relationships with people. I give thanks for success in my job. And you become a light giver. And one of the day comes along such as Thanksgiving Day, not a matter of taking time off for a brief day of giving thanks. I mention this often, but I have a problem with special days like Mother’s Day, or good neighbors day, or good relations day, and all these days. It always seems to me to be an opportUnity to take one time out, one day a year to send mother a greeting card, pick up the phone, give her a call, be connected as the phone company says. Tell her we love her and go back 364 days of ignoring her. I have a slight something within me that thinks of Thanksgiving in that way. It shouldn’t be that way, but sometimes it is. We take one day out of the year, devoted to giving thanks, smile on our face, happy hearts, inviting friends over to show our friendship and our thanks for each other. And have a prayer of Thanksgiving at the table, then carve the turkey, and it’s beautiful and wonderful. As Miss Carmen says, paraphrasing her words, “They’re praising God on Thanksgiving, they’ll be all right the next day. It’s just little habit they’ve acquired.” So, whimsically I like to say, “Why don’t we have one day of the year we devote to griping and complaining? Get it all out of our system.” Let the negativity just spew out, “It’s a terrible world,” then spend 364 days of the year giving thanks. It will never happen, but it’s a good thought. A man that I knew years ago, he was a delightful fellow, he lived in the country, in Arizona where they were a lot of hills around, and he had a substantial hill in the back of his house. Towards the evening every day in his retirement years, he’d climb to the top of this hill, ostensibly to see the sunset, which was beautiful. And actually to do his, what he’d call this thank thinking. And would have a frank and honest critique of his day. And the critique was in the sense of Aristotle’s meaning of criticism, looking for the good, looking for the good. So he would critique of the day looking for the good. Looking for the good in relationships and people, in the news of the day. Everything in his life, looking for the good. He’d spend time there just thank thinking about it. We might overthink sometimes they’re very negative sense. I feel that we’re creatively trying to solve the problems of our lives. Many of them are never going to be solved, until we dissolve them. And they’re going to be dissolved in our consciousness. By turning from the negative approach to the positive. And our complaining turns to the praising and thankful sense. I give thanks for this day. I give thanks for all the good that’s come to me this day. I give thanks for the opportunity to let my light shine tomorrow. Let my light shine, to be more, to do more, to have more in terms of more opportunities to give expressions the light that is in me. This man has always been an inspiration to me. His was a perpetual attitude of gratitude. It was a way of life, a consciousness. You couldn’t be in his presence for five minutes without feeling this emanating from him. This was a happy, thankful, grateful person. There were times in his life when he didn’t have much to give thanks for. But he’d sharpened and honed this realization of thank thinking in depression times, in times of lack, in times of sickness, in terms of family disputes, he developed an awareness that was a way of life. Make everyday a day of celebration by thanksgiving, committing yourself to celebrating the affluence of the universe. Celebrating the fact that you’re born into it. You’re born with great potentiality, with possibilities. Yours is the privilege of giving birth to that. So, on Thursday, many of us will be gathering at the table at Thanksgiving, which is probably what I’ve said, I love the day. It’s probably the only pure holiday that we have. Christmas is often being given over to trinkets and responsibilities, and pressures of giving. Other days of the year are days of getting emotional about patriotism and so forth. And as I said, Mothers Day can quite often be a day of excuses, procrastination. Thanksgiving is a pure holiday. No one has taken advantage of Thanksgiving, except maybe the cranberry merchant’s and the turkey growers. We’ll forgive them for that because we need them for our tables. But Thanksgiving is a pure holiday. They devote to do something that goes on within the person. When you sit at the table this thanksgiving, when you have slid in, or take part in, or listened to the grace that is said especially for thanksgiving, turn your thoughts within. Go beyond the of course you’d giving thanks for the things of your life and count to one. Give thanks for the realization that you are after all the whole universe and focuses you, that’s oneness. The light, the substance, the intelligence, the creativity of the universe flowing forth as you. Center your attention about that. Give thanks from that consciousness. So, instead of saying, “I give thanks for all this,” say, “I give thanks from all this.” All this and heaven too, because heaven is the divine potential within you. It has been given to you repeat with health, and substance, and creativity, and all the good that you desire, every present within you. Count to one and give thanks. I’d like you to join with me for just a moment in a time of celebration. I do this in terms of a visualization. It has been said that having seen and felt the end, you have willed the means to the realization of the end. Having seen and felt the end. What you see and feel, you always you desire. Now close your eyes, take a few deep breaths. Like my friend in the country, imagine you have a hill at the back of your house. At the close of the day, see yourself, visualize yourself climbing to the hilltop, sitting there to witness the sunset. A few moments reflecting on the beauty as the firey-arm sinks into the horizon. Made patient is the day is the is swept from the sky. The darkness at night descends revealing a panorama of twinkling stars, and have a frank and honest critique, looking for the good. Just look for the good in your day, in your life. Actually you even find yourself giving thanks for problems that you’ve had, mistakes have been made. They’ve showed you something better within you, something greater. And you’ve done something that you think is wrong, because the fact is you know it’s wrong, it’s evidence that you have grown. You can give thanks for that. And take a moment in this high top, high hilltop retreat, and count to one. As you look out into the stars at night all around you, the support of the universe. Think of all those stars is individual rays of light coming direct to you, the hands of the universe reaching out to bless you, to enrich your life. Then your life is good. Give thanks from the consciousness that you’re a spiritual being. Infinite potentiality is within you, no matter where you are along life’s way, give thanks for the fact that you always have more in you, more growing to do. More unfoldment to make, and there’s no end. Make the commitment to this feeling of gratitude, ready to go on, to keep on. Give thanks for the truth that has set you free. Is has opened a new oasis of awareness to you, helping you to see life as it can be. As you center your attention on the one, make a commitment that become a channel for the light. Bring light and hope and peace, and good to your friends, your loved ones, people of your city, the nation, and all the world. Certainly, with this consciousness, this experience of visualization, is much to be grateful for. You should know the truth, and the truth shall make you free, so be it. Amen. Nazareth Magarian. You may recall that Eric has taught us that God is a circle whose center is everywhere, and circumference is nowhere. I’m taking the privilege at this time to ask you to visualize the fact that we are, individually, centers of the universe, and collectively we are a center here at Avery Fisher Hall on our path and truth. Let us together in that circle, ever expanding place our teacher, our minister in our midst, and share this tribute together. In the New Testament book of Ephesians, there was a vision of the destiny of the church universal. In part, Paul writes, “He gave some apostles, and some prophets, and some evangelists, and some pastors and teachers. For the perfecting of the saints for the work of the ministry, for the edifying of the Christ within till we all come in the unity of faith.” Eric Butterworth has represented to all who have read and listened to his words, the embodiment of apostle, prophet, evangelist, pastor, and teacher. He has established in this ministry and aggregation of enlightened spiritual ideas, and has passed them on to us in our individual consciousness. He has truly taught that man must gain an understanding of God as spirit, and also must understand man’s own relation to spirit in order to understand the complete idea of perfect man in divine mind. For this, we are extremely thankful. For the 30 years of that ministry here in New York, we are thankful. For Eric’s continued ministry, we are thankful. For through Eric, this Unity center is an expanding oasis, a center of the Christ light that exists in each of us. Mighty to attract it’s good, and mighty to radiate good to others. Just as Eric’s teaching and example have been a blessing to us, we in turn can accept the affirmation, “I am the light of the world.” And we see Eric as the light of this Unity center, and we see our lives surrounded by a circle of light, providing guidance and protection. We can see ourselves consciously walking in the light, serene and confident and loving, and loved as never before. Those words were inscribed on last year’s circle of light New Year’s gift that Eric and Olga presented to us. So, this has been a circle of light year. With that vision of a circle of light, we are able to convert all that is negative, disillusioning, disheartening to become creative in the allness of love, abundance, wholeness, wisdom, and serenity, and all we do and all we see for ourselves and for all persons in all places. So again, we are blessed in having this ministry here, and we look forward to those 30 years more that Eric intends to be with us. Olga Butterworth. And Jesus said, who is my mother? Who are my brothers? These who think as I do. In that light of truth, there is a thread, we’re all a part of it. Each one expressing individually, but all part of an idea of human kind, spiritual beings growing and unfolding for the human experience. So, each time you count to one, you’re not only are embracing the universe that embraces you, you’re not only remembering your oneness in that one presence, but you’re saluting the divinity in you, and in everyone. This is what love is, and this is what giving is. Giving way to that awareness. So collectively, as a group soul, we take a moment when each one of us can just count to one. And like a little pebble that you’ve dropped into the wonderful sea of your consciousness, that crystal clear ocean of divine mind, just let it ripple out. And we acknowledge this as the activity of love, divine love flowing through me, blesses and increases, all that I give and all that I receive. Shall we know it together. Divine love flowing through me, blesses and increases, all that I give, and all that I receive. 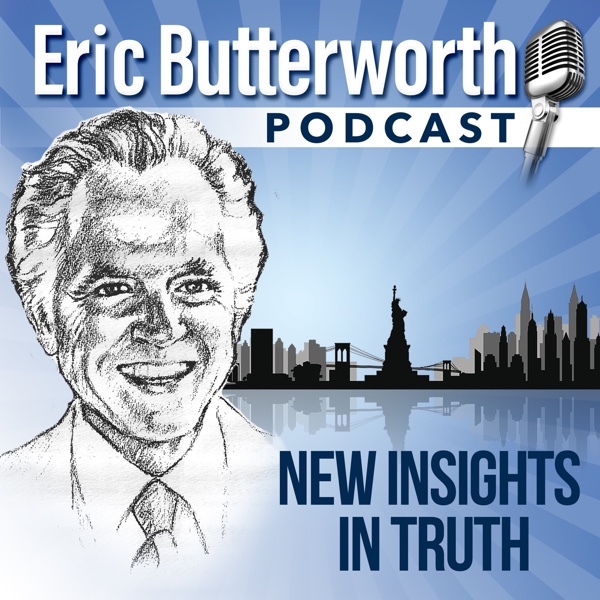 Eric Butterworth. Special thanks to Joy, France, Michael Trueblood, great musicians. We’re so glad you could join us today, and I’m certainly flattered and honored that you’ve given so much love. I pray it in the years ahead, I’ll deserve it. Next week we’ll be back to 2001 Sunday talk. The theme is Decisions Without Strain. That took some deciding, didn’t it? Decision without strain, we hope you can join us Sunday here at Avery Fisher Hall let’s ... And I often say that’s it’s the only show on Broadway that opens and closes at the same day. We’re happy to have you. I’ll just take a moment, really, we don’t to take too much for it today, but we have at this time, what we call our circle of light. We’re going to get still and you get the feeling of concentrating ourselves totally on giving. Giving our blessing to the world, people situations, anything great thing that happened in the world, give thanks for that faith, that belief, that trust. Give thanks for divine order, and always everywhere. It’s become a circle of light here now, and see this circle reaching out, expanding, encompassing all the people everywhere. Get the feeling of giving, thanksgiving, giving of ourselves, giving of our blessing. The kind of the energy that is in this meeting out into the world as a tangible resource to all persons who hunger.